The empty branches in the trees, the cold winter wind, and snow in the driveway can only mean one thing: football playoffs. I’ll duly admit to being a fair-weather fan. If the Mighty Ravens aren't in the annual tournament, I’m not that interested. But they were this year, and how they played has something to say about how winners invest. Football, like the stock market, is a game of matchups. The Ravens beat the L.A. Chargers handily to get into the playoffs. The Ravens used the speed of their rookie running quarterback Lamar Jackson to keep the Chargers guessing and back on their heels while their staunch defense blitzed almost every play. In their second matchup two weeks later, the Chargers made adjustments by putting in smaller, quicker safeties as linebackers. The Ravens should have made the obvious adjustment to this and put in their largest players on offense and simply run them over. This didn’t happen; the Mighty Ravens lost, and offensive play-caller Marty Mornhinweg was fired. The next week, the Evil Patriots of Boston played the Chargers. Their coach used Baltimore's defensive tactic of blitzing on every play and kept the Chargers off balance, and at the same time they ran the ball down the Chargers’ throat and won handily. It is the Patriots’ coach Belichick’s ability to adjust to his opponent that makes him a perennial Super Bowl contender. The most common investment advice you get is to dollar-cost average for the long term and, whatever you do, don’t try to time the market. This is good advice for your average investor who doesn't know a price-to-earnings ratio from a dividend yield. You just feed your 401(k) every paycheck, and you will be much better off than half of your peers who don’t even do that. However, because you are taking the time to read this and presumably other investment insight, you are much smarter than the average investor and want to do even better. Of course, the money managers and 401(k) hacks tell you never to sell or try to time the market. But if you are selling when shares are expensive and buying when they are cheap, is that market timing? Or just good investing? I’ve written before about my favorite chart: Warren Buffett’s cash position. 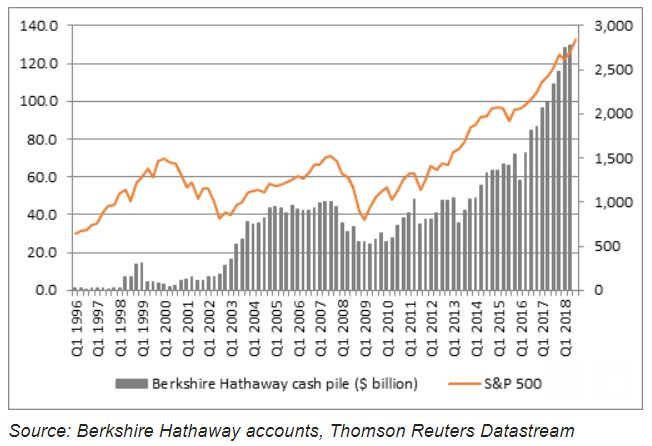 As you can see by the chart, Buffett has been able to raise cash just before the crashes: 1998–99, 2005–07, and 2017–now. Then, after the crash, the cash position went down because he started buying stocks. Right now the Dow Jones Industrial Average has bounced about 2,000 points from its recent low. This is a sucker's rally. Stocks rarely bounce back in a “V” formation. You should think of it as a gift from the market gods and take some money off the table — cash that you can later put to use buying on the cheap. There are very real signs of a slowdown in China and the EU: Car sales are falling. Plants are closing. Housing around the world is slowing, as Chinese money is no longer flooding out of China. That’s the gold ETF (GLD). Higher lows and higher highs are the definition of a bull market. We have higher lows (the circles on the chart) but have yet to hit new highs. Bull markets are like walking up stairs. 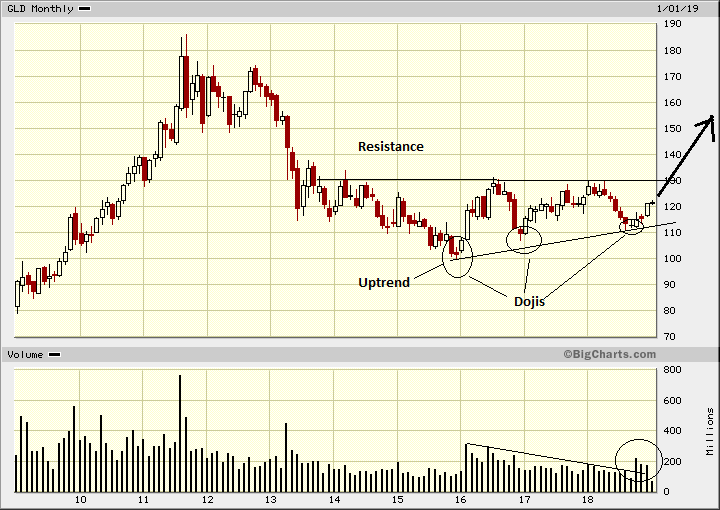 If GLD breaks above 130, we are off to the races and will be testing the old all-time highs. Use the current rally to raise cash and buy some gold.